Last spring in the wake of the tragic earthquake and tsunami in Japan my entire curriculum turned to the art of Japan. Students had a strong need to understand what they were seeing in the news and hearing adults discuss daily. Our 4th and 5th grade students joined students around the world in making origami cranes for Japan. The challenge was issued through Students Rebuild. Paper Cranes for Japan Inspiring an international movement—and 2 million cranes! In response to the devastating earthquake and resulting tsunami in Japan on March 11th, Students Rebuild partnered with DoSomething.org's "Paper Cranes for Japan" campaign to inspire young people worldwide to support their Japanese peers. We issued a simple challenge to young people online: Make and mail a paper crane, and trigger funding for recovery and reconstruction from the Bezos Family Foundation. Our goal was 100,000 cranes, which would trigger $200,000 to fund Architecture for Humanity's Sendai reconstruction efforts in partnership with Japanese designers and builders. The response—an incredible 2 million cranes from young people in 38 countries worldwide and all 50 U.S. states—exceeded our wildest hopes. Robinson Elementary sent over 300 cranes and gained understanding about world events and compassion for others in our world and how even children can make a difference. The students were so inspired and are ready to begin sending aid and help to others in need. Our next project will be inspired by Samantha Melvin and The Art of Compassion in sending to crutches to countries and children in need. 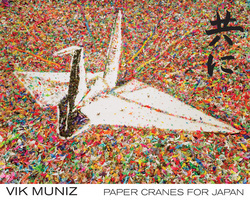 The Cranes sent to raise money to help Japan were transformed by artist Vik Muniz. The poster of the installation is still being sold to help continue to raise awareness and help with long term aid and recovery.